A creamy, mild pasteurised cow’s milk blue cheese made from milk produced on the farm in Cornwall on the edge of Bodmin Moor. Cornish Blue Cheese has been produced on the Stansfield’s Farm on Bodmin Moor since 2001 and is much loved by our customers. 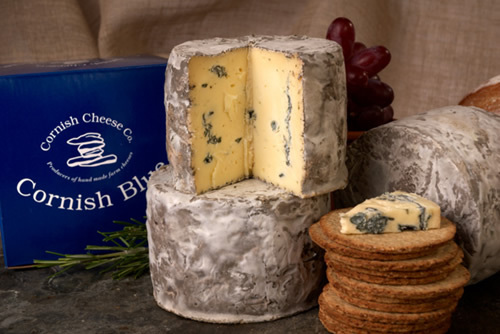 This sweet mild creamy cheese of distinctive character has been internationally recognised by the many Awards it has won including World Cheese Awards Champion Cheese in 2010 and Best Blue and English Cheese in 2007. Made from pasteurised milk produced on the farm. A must for any cheeseboard and wonderful in soups or casseroles.